The project proposal comprises 7 foundations for mega wind turbines up to 20 MW and 250 m in height. (Image courtesy of Risø DTU). A visualisation of the national test centre for wind turbines at Østerild as seen from the dunes at Hjardemål Klit, where the closest neighbours to the north are to be found. The distance to the nearest wind turbine is approximately 2.6 km. (Image courtesy of Risø DTU). The centre will have 250 m tall meteorological masts, 150 m tall measuring masts, 7 wind turbine foundations for structures up to 250 m, and with capacities of 15-20 MW. 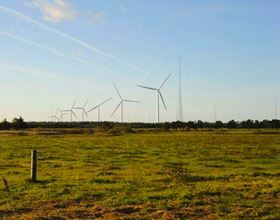 The first wind turbines are expected to be erected at the end of 2011 or beginning of 2012. 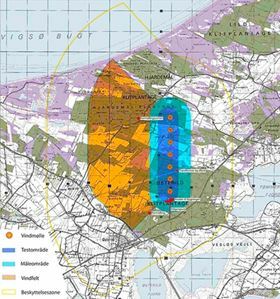 The site is over 4 km long and will supplement the test station for large wind turbines at Høvsøre in Western Denmark, which can test wind turbines up to 160 m.
The Østerild area has a higher degree of ‘roughness’ than Høvsøre. It also has space for testing two wind turbines in a stretch of woodland, which means the wind turbines can be tested under varying conditions. Wind turbine manufacturers will be able to buy or lease test stands. As the wind turbine test site has 250 m met masts, researchers can study wind conditions across a larger range of heights. Furthermore, due to the varying conditions, and the higher levels of turbulence at Østerild, more data will come in which can be used to improve aeroelastic models – models for aerodynamic design and wind turbine optimisation. “There will be far less uncertainty when designing wind turbines in the future,” Hjuler Jensen says. It will also offer a better insight into the wind turbines’ aerodynamic response to wind conditions, and very precise measurements can be conducted on the entire transmission system from the rotor to the generator. The wind turbine test centre may also include an advanced grid-connection facility. A consortium has been set up with Vestas, Siemens, Suzlon, Gamesa, DONG Energy, Vattenfall and ABB, which has received funding from the Energy Technology Development and Demonstration Programme (EUPD). The funding will help assess the possibilities for building an advanced grid-connection facility. The grid facility could be ready for use by early 2013. “Basically, we will be able to insert a filter between the wind turbines and the electricity grid by switching between DC and AC and back again. This enables us to test things on the wind turbines which the electricity grid is unable to ‘see’ or ‘feel’, which is a basic requirement for being able to experiment with the connection of wind turbines to the grid,” Hjuler Jensen says. “In the wind turbine industry, and important competition parameter is that wind turbines are tolerant to errors and frequency variations in the electricity grid,” he adds. SKF has opened its newly-built Sven Wingquist Test Center in Schweinfurt, Germany.